Their new range of speakers is designed with an improved Sound Equalizer and the superb ‘Sustaining Bass’ technology for party animals. The perfect balance of acoustics with sophisticated touch in these new speakers is a gift for tech lovers for round-the-clock entertainment, especially for late night celebrations on the New Year’s Eve. 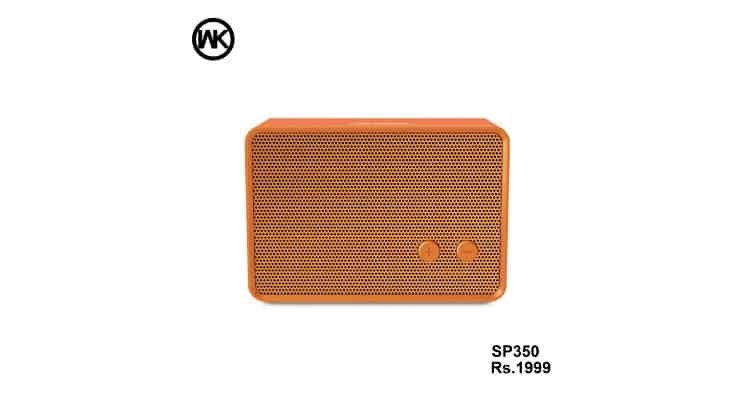 WK-TWS Bluetooth speaker SP500, which comes in black, grey and red variants with a quick charge time of 1.5 hours to provide up to 4 hours of usage. It enables you to enjoy your late night party with no disruptions. Bluetooth speaker SP350 comes with an inbuilt microphone that supports auxiliary connections and a transmission distance of 10 meters. Another fascinating product is Bluetooth speaker SP280 which is very light, exquisite and comes with an anti-skid design. With built-in 440 mAh battery, Bluetooth speaker RB-M26 would give you an uninterrupted music playback for up to 12 hours for an electrifying night. A futuristic variant, Bluetooth speaker ST800 for sports use has also been released which provides non-destructive sound with NFC function. Also, with a gorgeous appearance and an outstanding design, Bluetooth speaker ST650 is built to provide a superior sound quality that creates a wonderful party experience. Bluetooth speaker ST500 has an output of 6W x 2, the frequency of 90Hz-20 KHz and a 4000mAh battery for prolonged use. WK Life is the first company that has successfully combined telecom and electronics to create an umbrella lifestyle brand. It is a prominent multinational corporation in Hong Kong, with 1000+ stores in over 60 nations and more than 4000 employees. WK Life strives to maintain a high rate of customer satisfaction and minimize the impact on the environment by the manufacturing processes. WK Life offers a variety of unique designs in various categories including Bluetooth, audio, household articles, fashion bags, storage, and car accessories, with a 6-12 months replacement warranty for all products.